Bedlam plays powerful, fiery and inspiring music, both original and traditional tunes and influenced by English and French styles. 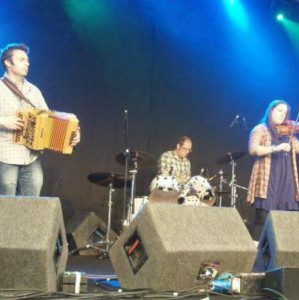 They are one of the most highly acclaimed dance bands on the ceilidh circuit. The line up features Bryony Griffith on fiddle, Will Hampson on melodeon and bass (both also members of the cast of the stage show The Lock In and the band The Demon Barbers), Drew McKinley on guitars and didgeridoo and Ross McKinley on percussion.